The U.S. Army responded to the request for a post in the vicinity of HBC's Fort Colvile to monitor the border and help prevent trouble between settlers and Indians. 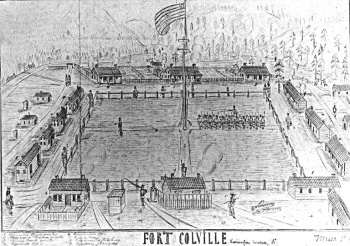 Two companies of the 9th U.S. Infantry, under the command of Major Pinkney Lugenbeel, arrived in the spring of 1859 to begin construction of Fort Colville, located about three miles east of the present town of Colville. Within four years, it encompassed forty-five buildings.